When the wind blows, trees have a habit of suffering the worst of it. With their low centre of gravity and flexing structures, strong wind gusts can push a tree over with ease, and where it lands can suffer damage, disruption, chaos, and of course injury. M.Large are able to assist in a number of ways. 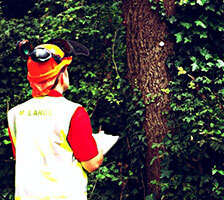 Ensure your trees or those near areas of concern are stable, safe and disease free. Get specialist advice. Our resident arboricultural team can advise on the health, position and most important, risk relating to trees prior to unforeseen weather or environmental circumstances causing them to topple. If in any doubt, lift the phone, call +442890342838 and get some peace of mind. 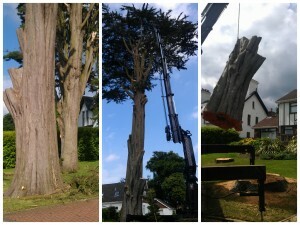 Technically a core part of our tree work involves the use of all sorts of specific and highly capable machines. It is comforting then to know that M.Large have our own in house crane hire division which includes a 27m HIAB knuckle crane capable of lifting even the biggest of trees in the event of them falling or damaging property. The HIAB’s are unique in that they operate like a normal fixed boom to extend up, but they can also extend out without rising to gain access over buildings, structures or obstacles but without the need to elevate high…including operating inside and even reaching into buildings or warehouses! M.Large’s crane hire comes with highly skilled operators on hand to advise and deal with fallen tree problems should they arise. ….WE CAN HELP YOU STAY THAT WAY. KEEPING A FIREWOOD PROCESSOR WORKING IN WINTER STORMONT CHRISTMAS TREE – BEFORE, AFTER….THEN AFTER AGAIN!